Despite that I’ve spent most of the last two decades enrolled as a student in one way or another, I’d be hard-pressed to describe myself as an academic. Perhaps it’s that my most-of-a-master’s is in camping, a degree most would probably consider too casual to be called scholarly, or maybe it’s that I dread the socializing: the answering of questions I’m unsure about; the politics of academia. Whatever the reason, I feel fairly uncomfortable with jargon like “synergy” and “network,” a point on which Alaska and I see eye-to-eye. Besides occasional department open houses and parties for retiring faculty members, my presence is required at few university-related events, which suits me just fine. So when my advisor suggested in February that I submit an abridged version of my thesis research to an international conference, I didn’t even balk. I figured I’d appease her by applying, wait a few weeks to receive a politely worded rejection letter, and be done with it. The congratulatory letter arrived in early June, informing me that I would indeed need to begin taking my summer writing project more seriously, as I was invited to give a fifteen-minute oral presentation of my research at the upcoming conference. I commenced worrying immediately. I’ve pretty thoroughly covered my summer of all work, no play (okay, some play), so I’ll skip ahead to the part where I arrive in Banff, screw on my best Me? What social anxiety? smile, and prepare to make small talk with strangers and celebrities, albeit only of this very niche market, for a week. The International Snow Science Workshop has been held informally since sometime in the 1950s, though its first official meeting was in Banff in 1976. It’s held in the US or Canada, alternately, every other year, and in Europe on off years, and is, as all conferences are, basically an excuse to round everyone up and geek out about something they all have in common. 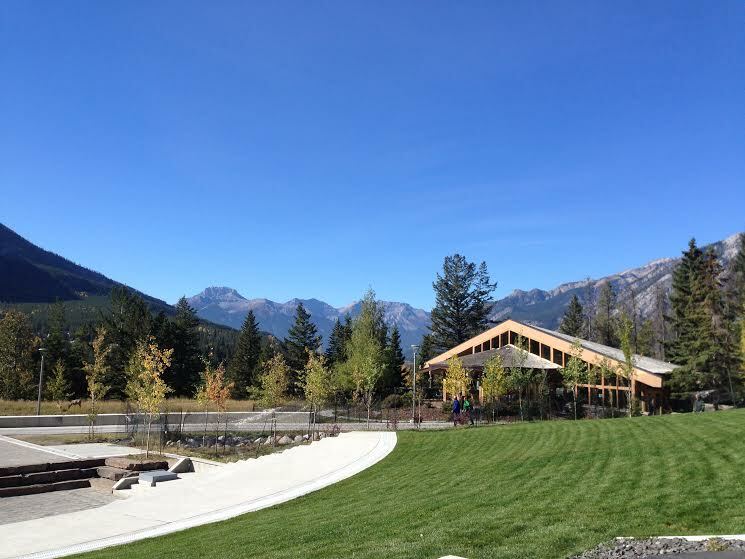 ISSW returns to its roots (and this excellent view) in Banff. (b) people who throw bombs at snow for a living and are too cool to dialogue (verb). Each day there were talks, poster sessions, and panel discussions on the topic at hand, and while I’m conversant on many of the snow science trends these days, I spent a great deal of each session not understanding what the speaker was talking about. Heads around me in the audience would be nodding appreciatively at explanations of the latest modeling technology and its implications as I furiously scribbled notes in my program: Read this paper! What is RAMMS? Try Wikipedia. Fortunately, my social anxiety is quelled by booze, and I’m glad to confirm the rumors that ski patrollers can hold their own at happy hour (and, as I discovered the night after my presentation, well into the wee hours). Well lubricated, I made many new friends and am assured of bomb-throwing opportunities at several ski areas around the country. My (literal) fifteen minutes of fame have arrived. This brief list occupied any spare moments I had until Thursday morning. Presenters were to attend a speakers’ breakfast, where we met the session chair who would introduce us to the audience. This inspired a whole new category of concerns (“Session chair makes empty promises about greatness of my research; audience is deeply disappointed and throws rotten vegetables”), but by the time 8:05 rolled around, I was miked up and ready to walk onstage. 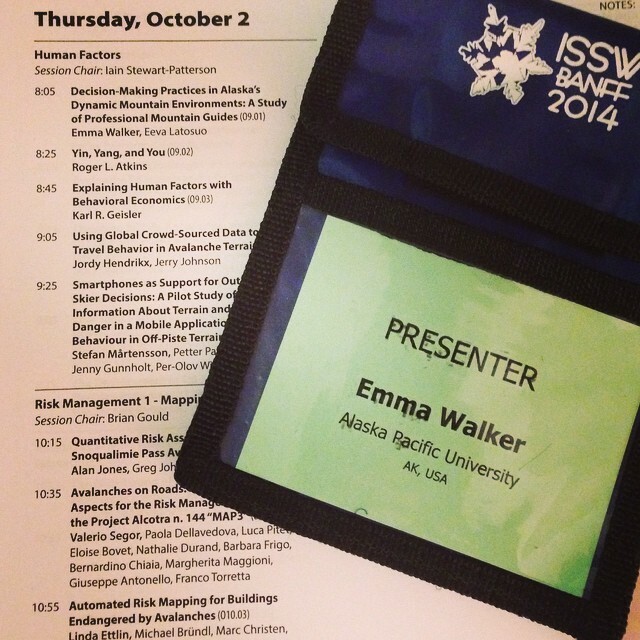 I remember very little of my presentation, except that I didn’t trip or throw up (!!!) and another speaker in my session promised me just before I went out that there was no food in my teeth. I was neither pelted with rotten tomatoes nor forcibly removed from the stage by a giant sheepherder’s hook. These are the makings of a great orator, right? It had also been my assumption that after my session was over and the speakers took more questions near the stage, I would eavesdrop on the conversations of the real scientists while awkwardly adjusting my backpack and hoping for a swift and merciful death. If you backcountry ski (or if you don’t backcountry ski but appreciate dry humor and good storytelling), you should read this book. Also Bruce Tremper talked to me. This had so far been the case when I saw Bruce Tremper (there are a lot of Bruces, aren’t there?) approaching the stage. 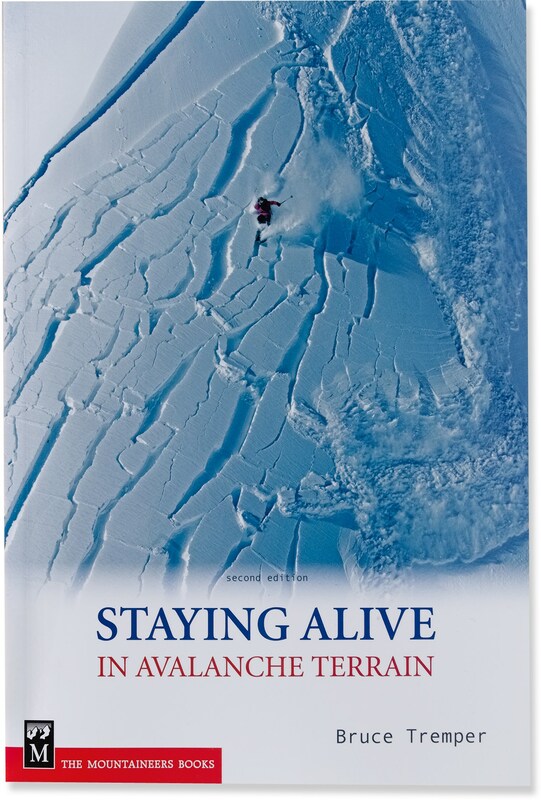 Tremper literally wrote the book on this stuff; we use Avalanche Essentials as part of the curriculum at the avalanche school and Staying Alive in Avalanche Terrain was required reading in my Level 2 class. I wondered which of the other presenters Tremper was coming to talk to, and actually moved out of his way when he stopped in front of me. It was only after he’d been talking for several seconds that I realized Bruce Tremper was talking to me. “I’ve written a couple of avalanche books,” he was saying. Nonchalant as always, I excitedly quoted Staying Alive, in which Tremper urges backcountry travelers to stay safe by always going out with a good woman. For about five minutes, despite internally kicking myself for being such a dweeb, I felt pretty cool. Okay. I’m not cool. But this experience really reminded me that cool is relative. First of all, there’s always someone cooler than you. My various mentors patiently allowed me to follow them around all week, asking questions, being introduced to their friends and contemporaries, and generally pestering them. I was grateful to have some guidance, but the best part was watching these people interact with their own gurus: former advisors, professors, bosses and mentors. I guess it’s pretty obvious, but I understood then that each of these people had once attended their own first ISSW, and was—though probably less awkward and dopey than I—nervous and excited and hoping to fit in. A common thread at this conference was the importance of mentorship. It’s a dynamic process, and without someone to check our work and remind us of what we have left to learn, even longtime professionals risk becoming overconfident and complacent. But seriously: No one worth listening to will tell you they’re an expert. I listened to dozens—dozens!—of people who have been teaching and practicing snow safety literally longer than I’ve been a human being say they weren’t experts. They might tell you an area they specialize in, or that they’ve seen a lot of avalanches, or even that they’ve written a few books, but not one of them will refer to themselves as an expert. It’s cool because those people all realize they still have plenty left to learn. It’s humbling to watch someone cool be so humble. And in what can often be a very macho environment (that’s a discussion for another time), it’s refreshing to see some humility. Ironic and shameless self-promotion right after I talk about how great it is to be in the presence of my humble heroes: if you would like a copy of my paper from the conference proceedings, like maybe because you’ve been having trouble falling asleep at night, here it is: ISSW_O9.01. Previous postReturn to the North: My Alaskan Odyssey, Part 3.